THE LAW comes to the aid of the truck driver when negotiating the bends on the Grafton bridge says a transport industry spokesman. Chris Blanchard, a member of the family-owned trucking company Herb Blanchard Haulage, said he had seen the coverage of the standoff between a four-wheel drive and a truck on the bend at northern end of the bridge on Friday afternoon. Bridge traffic was held up for about 20 minutes when a 4WD driver decided to stand his ground when a truck cross into the oncoming lane to negotiate the bend. The impasse lasted until police arrived and the driver reversed to allow the truck enough room to get around the bend. Mr Blanchard said from the images he saw on social media the truck was into the bend first and should have had right of way. "Ten to 15 years ago I did the research on this situation and I found a truck is fully legal to cross the double line if it has to avoid an obstacle," Mr Blanchard said. "And the bridge is an obstacle." 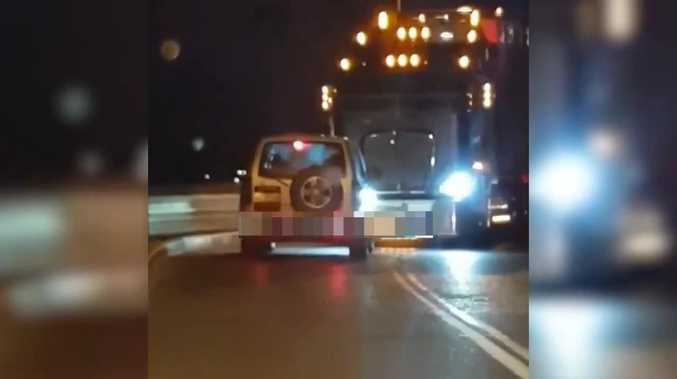 "I can't remember the exact rule, but basically it said if the truck is at the bend, first it can cross the lines to avoid hitting the bridge." This poll ended on 16 October 2018. Mr Blanchard said it should not come down to a legal argument. "Really a little bit of courtesy and common sense should save this sort of situation," he said. "If drivers had to wait during peak hour for a break in the traffic they could be blocking a lane for two hours." Mr Blanchard said whether truck crossed into the oncoming lane on the bridge was a combination of rigs, driver experience with the bridge and which end of the bridge the truck was on. "I've seen cars with horse floats and caravans cross the lines getting around the bends on the bridge," he said. "Something like a truck and dog tracks better than a semi-trailer and can get around the bound without rubbing the middle lines." "A semi-trailer with an experienced driver could get around rubbing the middle line, but a B-double with two trailers tracks a little worse and would need to go out into the other lane." Mr Blanchard said drivers unfamiliar with the bridge or who were inexperienced also tended to take a wide path around the bends. Mr Blanchard said drivers had to adopt different tactic for each end of the bridge. "Coming south semis have to wait for traffic on the two sharpest bends," he said. "From the south, leaving the bridge you've got to rub the middle line."